The concept is to take popcorn, break it down and distill its essence, then reconstitute it in a similar form, but totally different. From hot and crunchy to cold and crunch-creamy. What? Yeah. The best part is you only need four ingredients to do this: popcorn, milk, white chocolate and salt. Let’s do this. First I popped three bags of popcorn in the microwave. 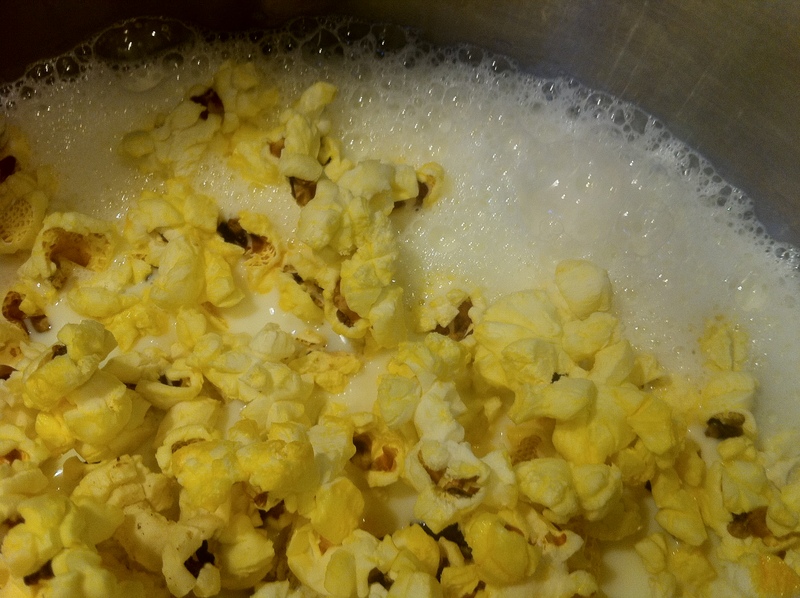 Next, the popcorn went into a pot with almost a carton of milk and brought to a boil. Then it steeped for 30 minutes. The popcorn gave up its flavor to the milk. 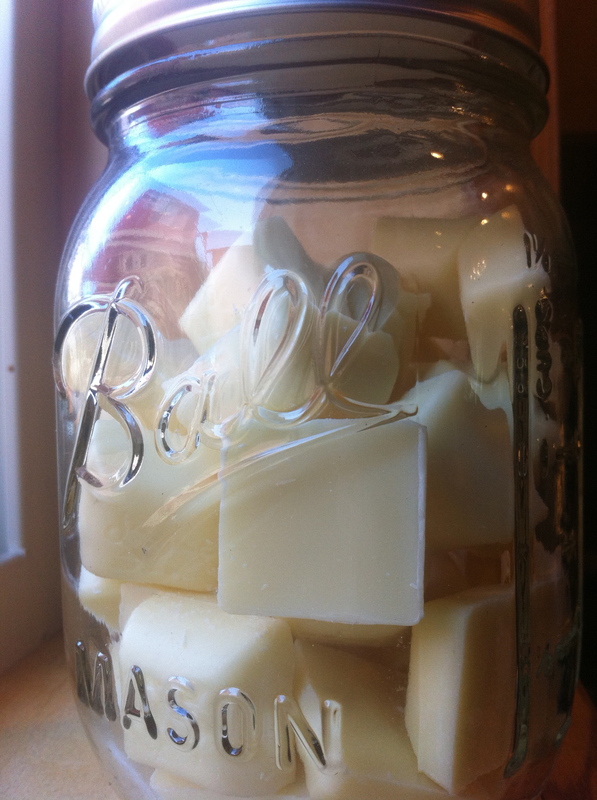 While that steeped, I took some white chocolate, put it in a mason jar, then put it in a pressure cooker for 30 minutes, caramelizing the chocolate. I accidentally grabbed some white chocolate truffles instead of bars. Was this going to be an issue? I dunno – let’s find out. 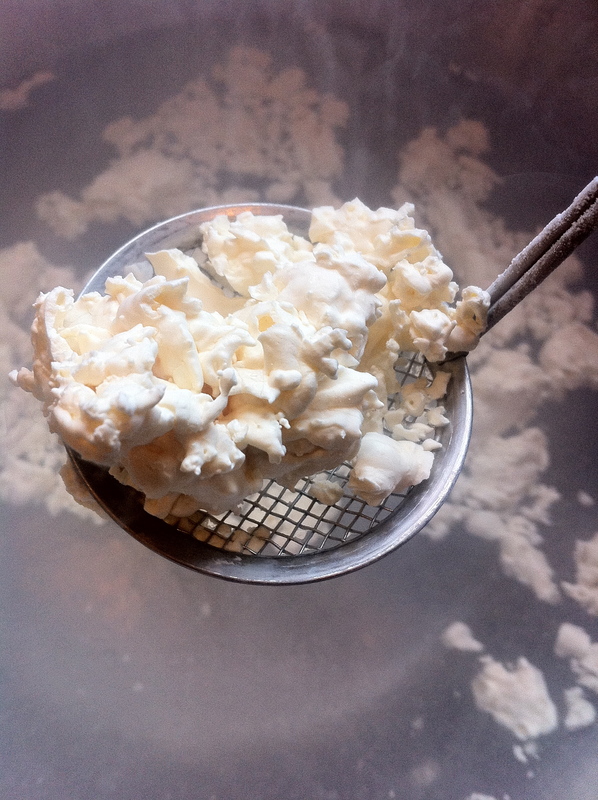 Next up was to strain the milk into a bowl, using the back of a ladle to squeeze out the extra goodness from the popcorn mush. I had my new tamis I had bought to make cornbread and bacon jam last month, so I used it instead of a normal strainer. So the first two uses of my tamis involved squeezing flavor out of corn. What’s up with that? Weird. 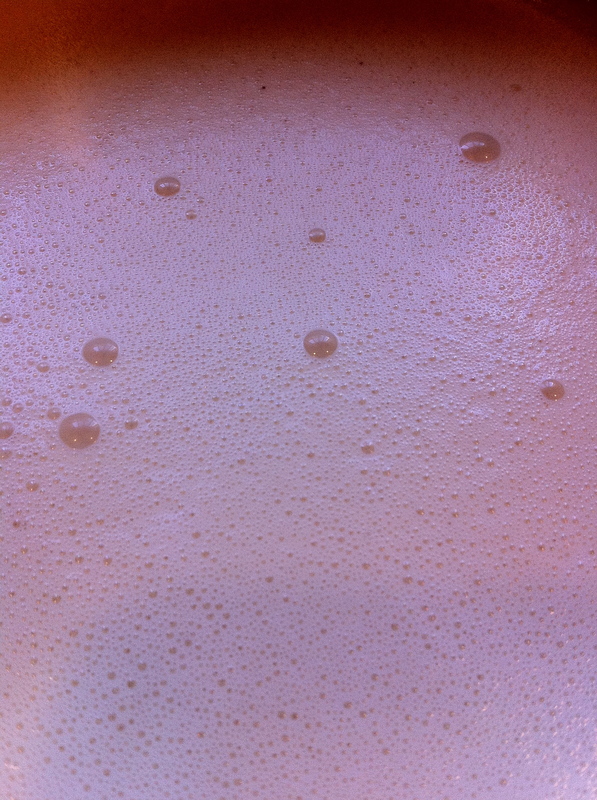 I then blended the milk, white chocolate and salt in my Vitamix for one minute and poured it into a bowl in an ice bath. And, just like that, I had an ice cream base. Flavored like popcorn. Now the fun part. 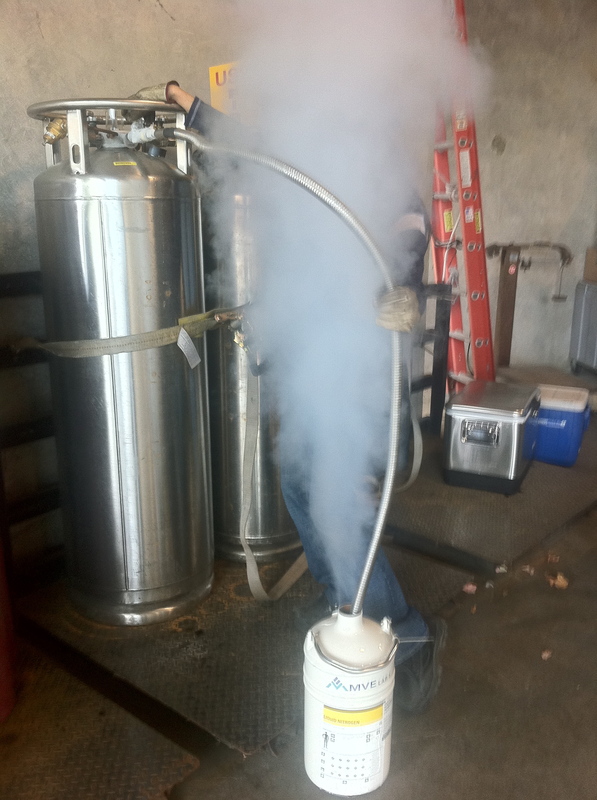 First, I needed to get some liquid nitrogen. So I went to my local store, Praxair, to get some. They know me there and quickly got my LN in the dewar. “You work in medical research?” “No, I just cook.” OK, maybe they don’t know me that well. As always, I carefully navigated my car back to Gastrophysics Labs without incident, and got back to the task at hand. I poured some LN into a bowl on the counter with a towel underneath. 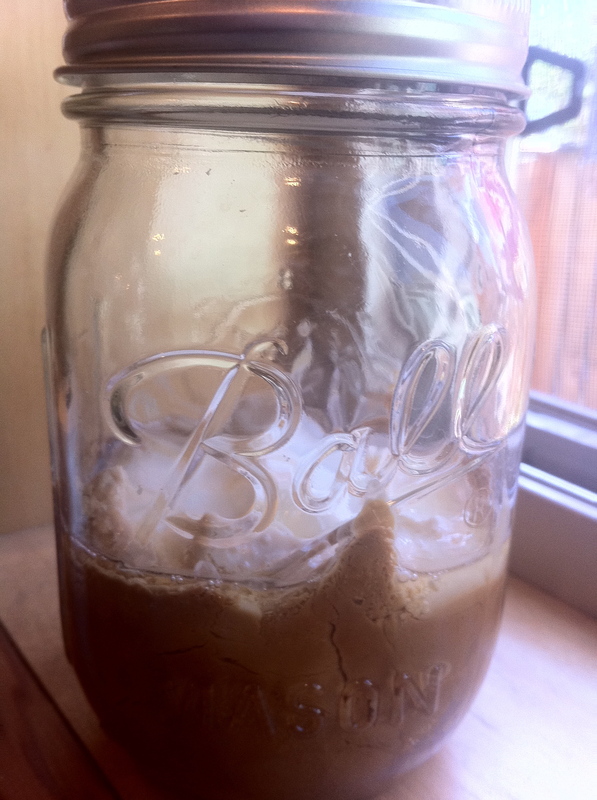 I filled up my whipped cream siphon up with the popcorn base and charged it up with two cartridges of N2O. 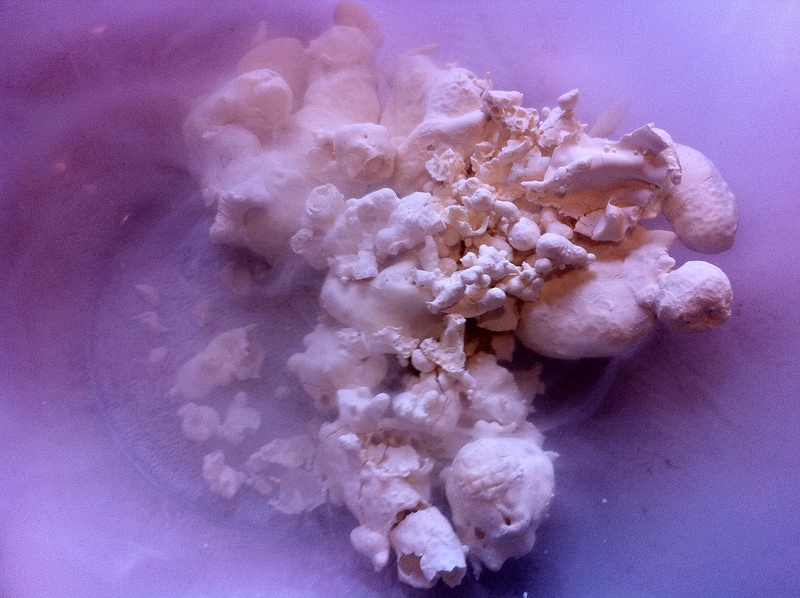 And from there, I sprayed bursts of popcorn foam into the LN to freeze up. The bursts of foam quickly froze, and with a few taps with a spoon, broke up into what looked like – you guessed it – popcorn. 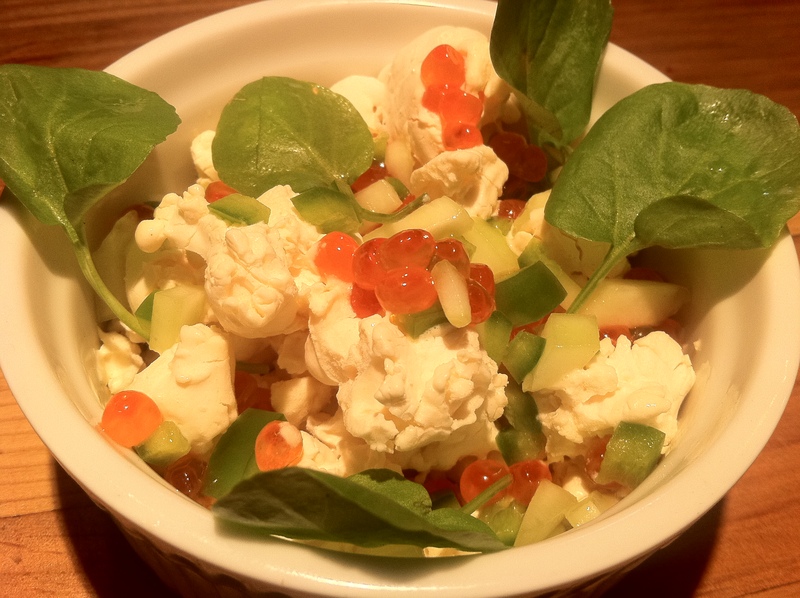 …we whipped up a batch of popcorn gelato which we paired with Steve’s sake cured roe, cucumber, jalapeno and watercress. 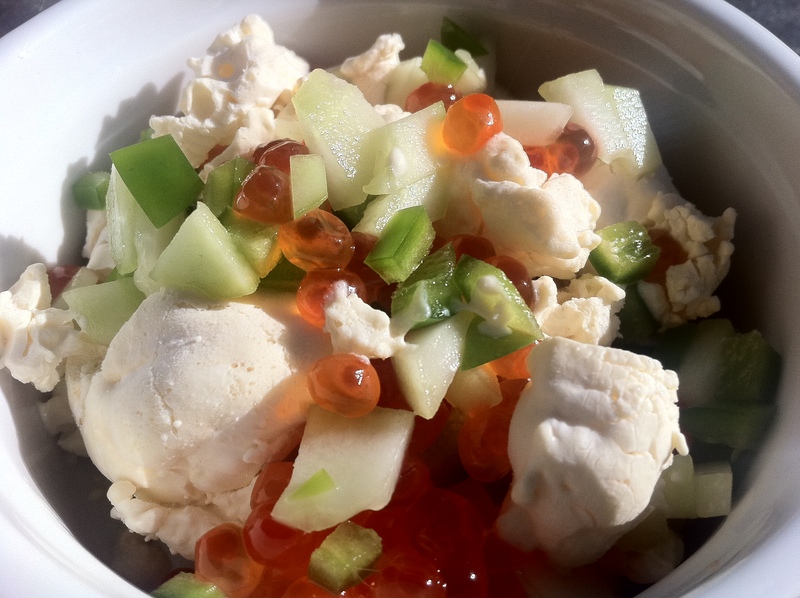 The cold creamy gelato hits the spot and the crunchy cucumber and popping roe are wonderful textural contrasts. That’s what I’m talking about. Let’s just go all the way here. I picked up some salmon roe from my local fishmonger Mutual Fish, grabbed some veggies from the store, and recreated the dish. I think this exemplifies everything about contemporary food design (Modernist Cuisine, New Cookery, etc.) in one dish. 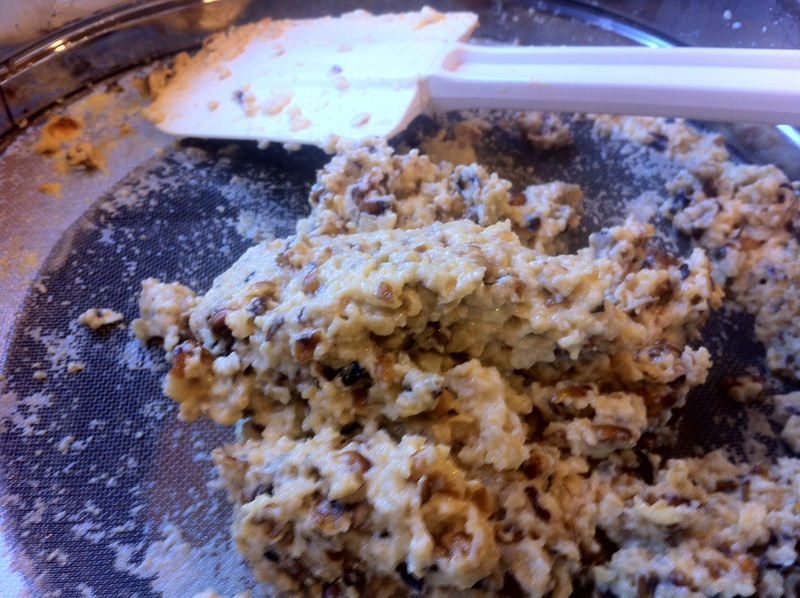 First you have the upended expectations – something savory becomes something sweet, with an opposite texture as well. You have an unusual food pairing (ice cream and fish eggs? What?). You have the culture clash of a low-end manufactured mass market snack mixed with high-end specialty caviar. You have the dreaded cliché modernist foam, but then frozen, another less seen modernist technique. 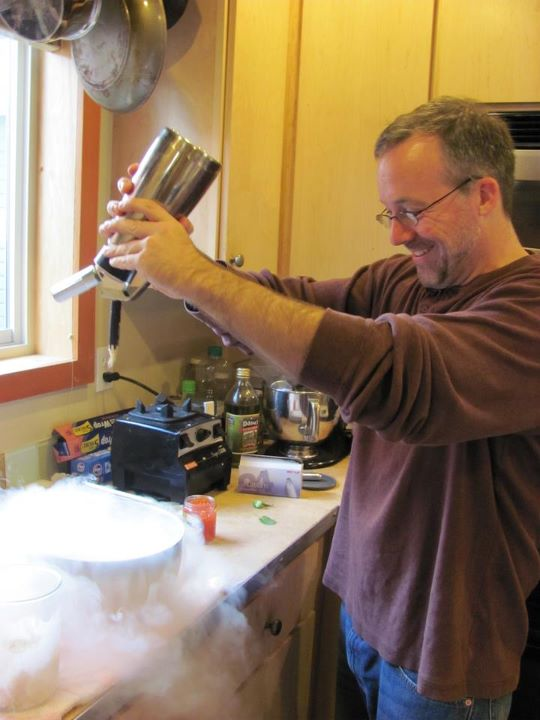 And finally, the panoply of gear to be used: a microwave, pressure cooker, Vitamix, whipped cream siphon and dewar. 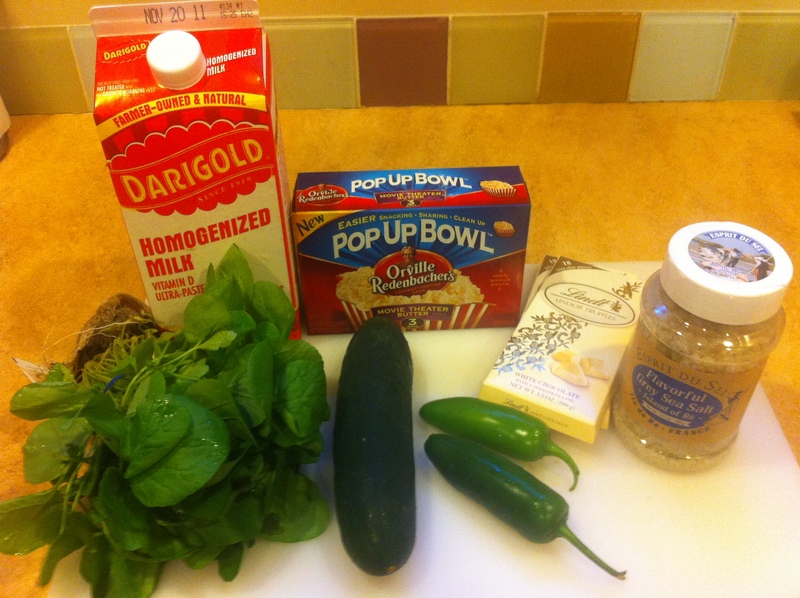 But there is one thing about it that isn’t usually associated with this style of cooking: it’s really easy to make. Aki and Alex are a fount of creativity and inspiration and I’m definitely headed back into their book and blog to cook some more. Let me just finish up this second bowl of gelato. > Why They Work, but hadn’t cooked anything out of it yet. I did their parsnip ice cream for my (9 year old) daughter’s Halloween party (amended as a ‘Neapolitan-inspired tricolor’ with carrot- and beetroot- versions alongside). And crikey it worked.